Manufacturer & Supplier of Structural Decking System. Our product range also comprises of Coated Sheets, Roofing Sheets and Structures and Ventilation Systems. We have established ourselves as trustful manufacturers and suppliers of a wide assortment of Structural Decking System. 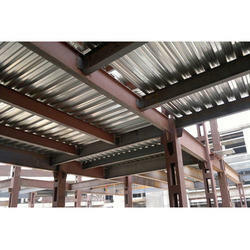 Widely used for high roof installations, these decks are ideal when designers demand a long span construction. These decks are highly appreciated for its superior strength that it eliminates the need of purlins, providing it an aesthetic and seamless look. Looking for Structural Decking System ?